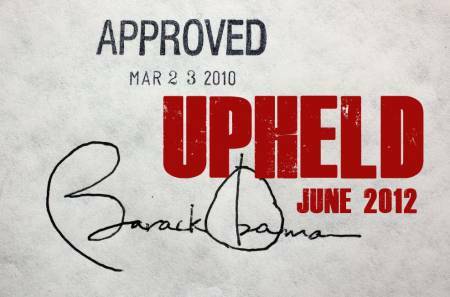 I have the supreme pleasure of presenting to you a constitutionally protected Affordable Care Act AND a vindicated Obama Administration. Haters may now exit the building. Thank you for playing, now please go play in traffic. As everyone and their momma should know by now, yesterday the Supreme Court of the United States of America (SCOTUS) handed down their ruling on the Obama Administration’s “Patient Protection and Affordable Care Act,” a.k.a. “ObamaCare” and victory is on the side of those Americans who believe ALL Americans should have access to affordable healthcare. YAAAAAAAAAAAAAAAAAY! The two key provisions to note are (1) the Individual Mandate and (2) the Medicaid Expansion. INSTEAD, a majority of the court determined that the “must pay a penalty if you do not comply” component could be viewed as a tax and thus is constitutional under Congress’ constitutional taxing power. The second key provision – the Medicaid Expansion – did not receive similar favorable treatment. Currently, Medicaid is a joint state and federally funded program that provides health coverage or nursing home coverage to certain “low-asset” people. However simply being considered a “low asset” person (i.e., poor) is not enough to qualify for Medicaid. You have to be poor AND fall within one of the defined eligibility categories – children, pregnant women, parents of eligible children, people with disabilities and elderly needing nursing home care. Under the Affordable Care Act, states would be required to expand Medicaid to include ALL income eligible persons under the age of 65. Specifically, “people with income up to 133% of the poverty line would qualify for coverage, including adults without dependent children.” (Wiki) If a state did not comply it would lose all of its Medicaid funding. A majority of the court ruled that although the federal government is allowed to “encourage” states to do its bidding – one example occurred in 1987 with the threat to withhold 5% of federal highway funds from states that did not raise their drinking age to 21 – however in this instance the court ruled that the Medicaid Expansion provision “goes too far” and is more like “holding a gun to the head” in order to get the states to comply and thus Congress had exceeded its constitutional authority with such a threat. And now let’s hear from President Obama!